Acumatica delivers a complete set of business software applications with dashboards, reporting tools, integrated document management, centralized security, and powerful customization tools. 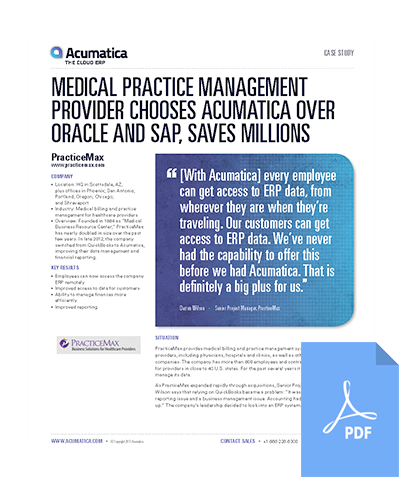 View case studies and see how Acumatica has fit well for other companies and enabled them to increase efficiencies and positively impact their bottom line. Consolidated West began operating in 2001. The company’s CFO, Ron Krieger, says they continually had challenges linking their specialized sales software with their accounting software. 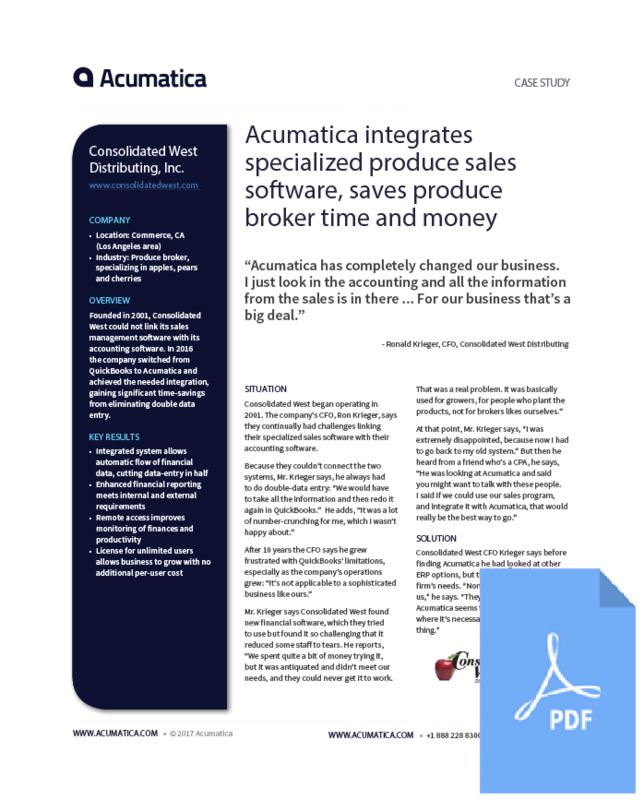 In 2016 the company switched from QuickBooks to Acumatica and achieved the needed integration, gaining significant time-savings from eliminating double data entry. Founded in 1979, Target Enterprises manages advertising campaigns in every state. With about 20 employees, Target delivers research, planning and media placement, primarily for political campaigns, ballot initiatives and corporations. Target Enterprises upgraded to Acumatica from Microsoft Dynamics SL after 19 years because Acumatica offered a more streamlined and interconnected financial data management system. AME Corporation is an ISO 9001:2008-certified supplier that specializes in custom rubber and plastic components and sealing solutions with facilities in both the United States and China. While the China facility allowed AME to provide competitive pricing scenarios to its clients, there was the challenge of managing the placement, processing, and shipment of orders between AME’s New Jersey and Shanghai locations. As a result, AME decided to move its entire operations to the Cloud, starting with its ERP system, to allow its facilities in New Jersey and Shanghai to share and access files, documents and inventory levels on one secure system that would protect the client’s intellectual property. DDB Unlimited produces rugged enclosures for use in telecom, traffic, security, electrical (NEMA), and other applications. The company has multiple product lines that are shipped around the world to major industry players as well as single purchase customers. Rapid growth required DDB Unlimited to automate and improve processes across multiple locations and production facilities. Hi Spec Doorsets is an innovative and well-respected manufacturing company in the UK, providing high quality doorsets for the construction industry. 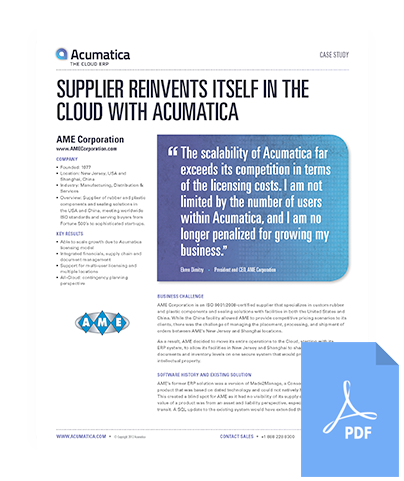 Prior to implementing Acumatica, the company ran a client/server-based system called EFACS. This was a traditional ERP package that never quite met expectations. The sales staff would have to wait until they returned to the office to update their leads, contacts, opportunities or sales orders, or they would do battle with some remote login software, or have to ask someone in the office to enter their information. This was extremely frustrating and wasted valuable time. IntraCoastal Environmental (ICE) is an emergency response and environmental services company providing a total solution that helps its customers contain oil spillages by deploying an optimum mix of strategy, technique, equipment and talent around the clock, seven days a week, 365 days a year. ICE also offers a variety of base environmental and industrial services. To allow ICE to continue to grow in an industry that is governed by strict regulations around the handling and disposal of hazardous materials, it became clear that a company-wide resource management system was required to empower its employees in the field and manage its sizable fleet of heavy vehicles and equipment. J. Goodin is a manufacturer and distributor of fashion jewelry that needed an ERP system to manage sales orders, purchase orders, inventory, and accounting. The system had to be efficient in order to process a large daily volume of orders and customizable in order to support both current and future business processes. The new software needed to support several sales models including a make-to-order process as well as a make-to-stock process for distribution through several sales channels such as Amazon.com, jewelry wholesalers, and retail outlets. PracticeMax provides medical billing and practice management systems for healthcare providers, including physicians, hospitals and clinics, as well as other medical billing companies. The company has more than 800 employees and contractors, handling billing for providers in close to 40 U.S. states. For the past several years it used QuickBooks to manage its data. As PracticeMax expanded rapidly through acquisitions, Senior Project Manager Darren Wilson says that relying on QuickBooks became a problem: “It was mainly a financial reporting issue and a business management issue. Accounting had a hard time keeping up.” The company’s leadership decided to look into an ERP system. The Quantum Group is a producer of high quality, custom-manufactured fabrics which are used in a variety of commercial and industrial applications. Quantum has a complex corporate structure consisting of seven companies in three different physical locations. Managing this corporate structure without excessive software expenses was critical for Quantum’s business. At the headquarters level, Quantum needed general ledger, receivables, purchase orders, and payables functionality that was performed by several different individuals. The solution had to be accessible from any location without the expense and challenge of installing and maintaining client software.